[Final Fantasy XIV] My Little… Gobbue?!? Author RakunoPublished on July 29, 2012 May 22, 2017 16 Comments on [Final Fantasy XIV] My Little… Gobbue?!? Anyhoo, it was easier than I thought. When the announcement hit that the quest to get it was going away with patch 1.23a I had about a month to get 13 levels on one of my classes to qualify for it (the quest requirement is level 30 in one of your classes. My highest level was 17). My plan was to focus on just my pugilist class since it was my highest one, and a few crafting/gathering classes to support it throughout the levels. That I did in the beginning. Then my fickleness hit me and I went playing Skyrim instead. When I was finally able to break free of Skyrim draconian clutches the month was almost over so I had to change my plans and focus just on the pugilist class. The crafting/gathering ones would have to wait for later just like the other adventuring classes.That worked better than I expected and I got it relatively fast. The only drawback is that I spent some money on gear upgrades instead of crafting them as I was planning initially. Probably unnecessary since at least until level 30 Final Fantasy XIV doesn't seem to be too reliant on gear. Still I thought it was better safer than sorry and it did make things easier. It was also nice to see a bit more of the main storyline as well as the Grand Companies one. Without going into details, as to not spoil it to anyone, some questions were answered and a few more raised. I also got to choose a generic companion to help out during the main storyline quests. As for the Grand Companies storyline it was interesting to see it is more related to the main storyline than I thought. Basically both deal with the Garland Empire threat although the Grand Companies seems to be worried also about something far more larger and dangerous than the Garland Empire. Or perhaps the Garland Empire might be related to it. I am not too sure yet. Oh, if anyone didn't get the gobbue mount yet there is still time to do it. As of this writing patch 1.23 has been released but the quest isn't being taken away until patch 1.23a. Do hurry though since patch 1.23a should be arriving at any time now. You can find the instructions to obtain it here. For those scratching their heads because of the similarities on the nomenclature of those patches, this is how Final Fantasy XIV tags its updates: if it is just numbers then it is a larger content and bug fix update. For example: patch 1.22 . If it is the numbers and a letter than it is small bug fixes and minor content they weren't able to get in with the numbers-only patch. They are usually introduced shortly after the numbered patch too. For example, 1.22a which was released about two weeks after patch 1.22. I know what you mean about fickleness. I have such a hard time sticking to one game, especially when I feel like I have to do something in it before a time limit. A time limit only guarantees for me that I will *not* want to do whatever it is before the time runs out, and I end up having to make myself avoid everything else until I complete whatever goal I have for the timed event. Ugh! And then I don't always succeed. Like I still haven't gotten the pink unicorn mount in Everquest 2 for Kelel because every time February rolls around when that quest is going, I am never in the mood to play. I'm hoping this February will be different because I really want that mount for him! Yeah. I never liked too much those time limit things. I get it is a marketing thing but it really puts me off. Although to be fair with the gobbue mount there was about... Hmm... I don't remember exactly when it was introduced. Six months ago? Plus all you have to do is be level 30 in one class, talk to a guy in a very accessible camp and it is yours. They also announced it during that update that the quest would be removed before patch 2.0. Since this is the last series of patches before that it makes sense for the quest to be removed now. So, all in all, the only people who would have trouble getting it would be people who procrastinate a lot *coughs*likeme*coughs*, people who started right now or who weren't able to play for a reason or another during all this time. Oh, yeah. Events in Everquest 2 can be terrible to get the stuff you want. All that token grinding.... Plus the way they have been doing pretty much one event after another makes it even worse. Anyway, I don't remember all the details but would there be any way for me to help you get that pink unicorn for Kelel? Sometimes 6 months makes it worse because you think that you have aaaallll that time to get it done, so you'll just do this or that other thing instead and then it just creeps up on you. If I'm remembering correctly, you just have to collect 200 of those Erollisi Day tokens to buy the unicorn from the event vendor, so you should be able to help once it gets close to Erollisi Day. What's sad is that I have a bunch of candies in the bank that I can turn into tokens, and have had them sitting in there for 2 years now, so I may not even need that many extra tokens if I could just make myself get in game at that time of year and do it! True, true. Still I feel silly because I could have taken all that time, done it and often done it better. Oh, well. The important thing is I got the gobbue I guess. FFIV (and Lotro) is one of the few MMOs that are rotting on my list of to-dos; if it was still free-to-play I probably would've given it a shot by now. 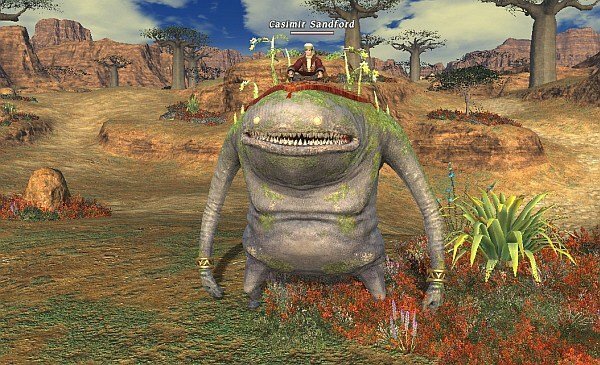 FFXI was the first MMO I truly immersed myself in, SE just creates visually stunning and polished games as we know. it's too bad they had all these initial hiccups with the online successor...else I would've played it for sure at launch. out of interest - is the combat still so slow and boring as people reported in the beginning? And yes, it is unfortunate how the release of Final Fantasy XIV went. Fortunately things improved a lot since then. It is not quite there yet. Maybe when 2.0 hits since it has been promised as the big relaunch of the game. Combat is one of those things that received some improvements. It is not as fast or chaotic as Guild Wars 2 but it is certainly much better than release. It is more tight, if it makes sense, and there is still a bit of tactical thinking involved. At least that is the case with the pugilist class, the one I have the most experience with. Hmm well congrats on the pet ! I just got the email about the redo of Qeynos, kinda tempted to go see what it's like, but its so lonely now, with most everyone I used to play with gone. I bought tera, to see if it was any good, and after trying for an hr put it aside, hate the UI, I am a clicker through and though, didn't like having to use buttons/hotkeys for attacks / skills etc. Right now don't have any Mmorpgs at all I'm playing. I DID read an excellent book though related in a way to that, "Ready Player One," and also am following a new anime that is very good on Crunchyroll "Sword Art Online" which evidently is based on a light novel series. Yeah, I've been tempted to play Everquest 2 for that and still for the danged decoration withdrawals. But still I've been avoiding it as there isn't much of a point for me to play it anymore. About Tera, I knew it had action based combat but I thought you could at least click on the skills/spells. But from what you say seems like it is not the case and since I am a clicker too, I can feel your pain. Have you considered Guild Wars 2? I am not sure if you like it since it does its own thing but it pretty much follows the same business model as Guild Wars 1. I.e. you just buy the box but doesn't need to pay subscription. Although there is a cash shop from the start where they sell fluffy stuff and some conveniences. I have considered Guild Wars 2, I was more enthusiastic about it in the beginning, but I may still get it, to try it. I've played Guild Wars the original a little. It's not bad, but there are things I miss, or don't like in the original. First... my friends, I've tended to follow friends, nearby and online from game to game, at least giving the new game of the month a try, most I haven't had staying power with though, or they would move on and I would be left behind, which gets lonely after a bit. 2) persistent not instanced.. world. I understand the logic of making dungeons instanced (not that I totally agree) , but when too much of the game is instanced I find I lose the feeling of being in the world. Vanguard did this well, despite it's other flaws. ... my first MMORPG, Asheron's Call 2 was like this, except for a few dungeons that had instances. 3) mounts... I was kinda disappointed that they decided against adding them. They just add a coolness factor, there was always the excitement in different games of getting your first mount. Not even necessarily cause you went much faster but it was just more immersive I think. 4) Housing (know you agree here) I guess I'm spoiled by EQ2. I want to be able to have a place for my guy to store all his trophies and stuff. Perhaps sell things from there etc, and of course decorate. "Sword Art Online", is looking to be a story with a world closer to a modern RPG in some ways, and is a lot darker in some ways, although .hack had a lot more .... I guess mystery is a good word for it, things you slowly figured out as the series went along. One of the cool things about "Ready Player One" for me is that it's heavily based on 80's (U.S.) culture: movies, computer / arcade games / music / other stuff. Alot of it was like a trip down memory lane for an elder like me, since that was mostly my teens... lets see I turned 14 in 1980 and got my first computer a year or so later... a Timex Sinclair ZX81 ... it had a whole 1k memory (until i got the 16K expansion module) and had to save and load programs from cassette tape ! One big reason I don't play Guild Wars as much as some of the other games is because I have to make a larger time investment each play session when working on a mission. Since you pretty much have to finish the whole mission in a single play session unless you want to start over the next time, I tend to pick games that will allow me to afk more without worrying that I'll lose connection. So I typically pull out GW when I'm really in the mood to invest a lot of time on it all at once. GW2 seems like it may be different in that respect. And yes, Guild Wars 2 is a bit different in that respect. It doesn't require as much time investment to get things done. It also does its own thing but I find it more addicting and easier to learn than Guild Wars 1. Go figure! The earliest I remember of such things is with 5" 1/4 diskettes on a 386. Our MSX didn't have something to save or load programs (probably because we didn't know about it or my brother knew but didn't bother bugging my parents to buy it). So we had to code anything everything we turned it on and see it go every time we turned it off. Ah, good times, good times. Well, if it make things better (or not) the only thing that Guild Wars 2 has in common with the original is the setting, the name and the same company developing them. Otherwise they are each one their own games. 1) *nods* Understandable. To be honest I have been secretly hoping our friends will play Guild Wars 2 as well. The only reason I have been asking them to give it a try is because so far there hasn't been any announcement of a free trial and I haven't been able to snag another beta key for any of them. Even if they just have to pay for the box it is still a considerable investment and I'd rather not everyone spending that kind of money without knowing what they are getting into. Specially since they seem content with what they are playing right now. If there is a free trial for the game though I will be trying to convince everyone of them to give it a try. 2) Yeah. I don't like a world that is instanced too. Makes it feel like more a single player game than anything else. Fortunately the world in Guild Wars 2 is not instanced. The zones are pretty large, shared with everyone. Only instanced areas are the dungeons, the personal story points and your home neighborhood. Every other place is shared by every other player. 3) *nods* I do like mounts too but if they aren't implemented well or the lack of them isn't a big deal then I don't mind it. This is personal preference though. 4) True. The only reason I am not disappointed about this point is because I am sort of resigned about it. It seems that I either find a game with housing I like but dislike the rest of the game or I find a game I like but dislike their housing system. Supposedly Guild Wars 2 will have housing at some point after release. But who knows when that will be or what form it will take. Although desperate as I am, I might just take whatever they throw together and be content with it. Cool. The only .hack// I'd ever had was the anime .hack//SIGN anime and the OST. Never got my hands on any of the others though. This is something I've been wanting to do some day though but I always forget. The games I probably won't ever play however since I don't own a video-game. *nods* Yeah, .hack//SIGN definitely had quite a few mysteries to it. Hmm... I am really intrigued by "Sword Art Online" now. I will see if I can hunt it down. Heh. I was a child in the 80ies, but I can relate. I remember going to the arcades in the mall (since shops with only arcades here were unusual, at least in the city I live in), the movies (even though I barely remember any of them), the music, etc. I don't remember if it was back then that I had my first contact with a computer or not. It was a MSX though the one we had in our house didn't use tape, I think. I want to say it used diskette but that doesn't make sense since I remember diskettes more with the 386 my brother got years later. Perhaps it was a cartridge? I have no idea what it actually is, but that new pet of yours looks AMAZING. hey Rakuno, what server are you on? Wish I could chat with you in-game.